This clause is a remnant from a time when mobile phones boasted displays that showed just a few lines of monospaced characters and could not render bitmap images. As a remedial feature, mobile clients included a set of glyphs conveying stereotypical representations of actions, states and objects. These graphical symbols, frequently stored as a special font in the terminal, could be referred to in Web pages and served as a substitute for richer, but unprocessable pictures. HDML, a markup format for the mobile Web elaborated in the mid-1990s, offered a syntactic construct to this effect. Pictograms were soon considered to be useful as such, and made their way into i-Mode, WAP and UNICODE specifications. They are not specific to a single program, but are standard symbols accessible from all Web applications. The drawback is that their pre-defined style does not allow for a brand or organization-specific look-and-feel. They do not have to be explicitly installed, for they are built in the client software. Relying upon pictograms potentially reduces network traffic, as the corresponding images need not be downloaded to the terminal. Because they are usually handled like characters, it is straightforward to embed them in a normal text flow. On the other hand, they are often unsuitable as components of a graphical user interface. Whether in household appliances, packaging, or car dashboards, pictograms are ubiquitous in daily life; their application in mobile services is thus a natural step. Distinguishing similar elements from each other. In the mobile Web, a clickable link may serve to navigate to another Web page; to initiate a file download; to establish a telephone call or a video call; to send an SMS, an MMS or an e-mail. A pictogram identifies the type of action corresponding to each URL. Drawing attention to specific items. signalling that the activation of a button or a link entails a side-effect. meteorological forecasts provide overviews constructed out of images for each weather condition (e.g. “heavy snow shower during the day”). Pictograms act as signifiers so that textual expressions of those concepts are never employed. Well-known instances are emoticons and traffic signs. The preceding picture illustrates various forms of pictograms. 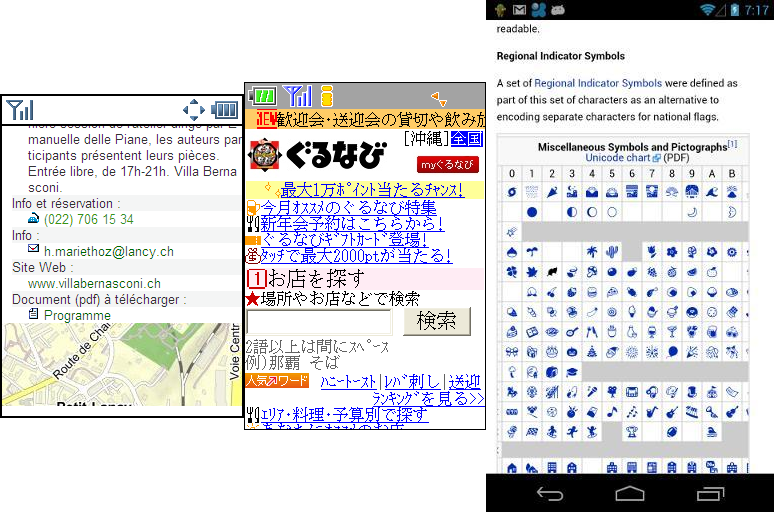 From left to right: a WAP XHTML document with symbols identifying link types; a typical i-Mode page generously spiced with emojis; and a Wikipedia article showing support for ISO pictographs on an Android handset. Just like with many other aspects of the mobile Web, the deployment of this venerable, albeit little-known building block must cater for various generations of competing standards and discrepancies between implementations. In the following, we survey the ways to declare pictograms in mobile Web pages and provide correspondence tables between relevant symbol dictionaries. Nowadays, the original Openwave browser documentation can be retrieved only from the Internet archive. To this day, the Japanese operator KDDI commercializes phones featuring Openwave software which, depending on the device class, incorporates built-in icon sets supplementing the basic dictionary, or retrieves them as external resources. KDDI publishes on its WWW site a correspondence table between handset models and supported icon ranges. Although all pictograms are assigned names, they are usually embedded in Web pages with the Openwave numbering scheme. Icons in overlapping ranges are compatible across all Openwave devices, but slight variations exist: several arrows pointing straight upwards or downwards (numbered 42, 43, 70, 71) become oblique in later implementations, whereas some simple triangles become doubly tipped ones (7, 8, 34, 35). The browser outputs the pictogram for new if locally available; otherwise, it downloads the file indicated in the img tag, or displays the string in the alt attribute if the image itself cannot be rendered. Older browsers (such as Motorola MIB) may subject pictograms to the same restrictions as external bitmaps – for instance enforcing a limit on the number of images that can appear on a Web page. The local presence of specific symbols may vary from a browser version to another; the following compatibility table therefore considers whether the client software recognizes the WAP pictogram syntax and defaults correctly to an external image when appropriate. It appears that, while most browsers recognize the syntax declaring WAP pictograms, this feature is fully supported only by legacy browsers not based on Webkit and explicitly preferring XHTML mobile profile over HTML and XHTML basic. This presumably excludes the newest generation of the NetFront (NX), Obigo (v. 10) and Myriad (Openwave v. 9) software built upon Webkit, which could not be tested at the time of this writing. One should also keep in mind that interactive mobile Web validators such as mobileOK and mobiReady are geared towards XHTML basic, and hence may erroneously flag WAP pictograms as mobile-unfriendly resources. The official reference for WAP pictograms is published on the OMA WWW site. ISO normalized numerous pictograms with UNICODE 6.0, refining proposals originally submitted by Google and Apple to harmonize Japanese emojis. The corresponding code points are reserved in various blocks of the UNICODE space, chiefly “miscellaneous symbols and pictographs”, “emoticons”, and “enclosed alphanumerics supplement”; blocks “transport and maps”, “miscellaneous symbols and arrows”, “miscellaneous symbols”, “dingbats”, “enclosed alphanumerics” also contain useful pictograms. Several character blocks of interest are located in the UNICODE Supplementary Multilingual Plane. Third-party applications do not always handle characters outside the Basic Multilingual Plane properly. As a consequence, some symbols may be correctly displayed, while others are unrecognised. This appears to be the case with Opera Mobile, which does not render all standard ISO pictographs enabled on Android 4.1. Pictographs are usually provisioned through the default system typeface built in the terminal. They may become inaccessible if the user switches his browser or general user interface preferences to a different font. Content styled with specific typefaces raises similar problems. Regrettably, CSS offers no construct to force a textual element or a numeric character reference to be rendered in the context of the default client font. In the following, we consider the pictograms listed in tables of sections 7 and 8. IPR symbols refer to signs for “copyright”, “trademark” and “registered trademark”. Android ≥ 4.1 Extensive coverage of the ISO norm, with just a couple of omissions in the core dictionary. Bada ≥ 2.0 Supports circled digits, IPR symbols and a couple of isolated pictographs. Blackberry ≤ 7.1 Implements circled digits one to ten, IPR symbols and the single traditional smiley. iOS ≥ 6.0 Exhaustive provision of “emoticons” and “miscellaneous symbols and pictographs”. Meego ≥ 1.2 Circled digits, most arrows, IPR symbols and a handful of other pictographs. Nokia S40 ≤ dp 2.0 Only implements the IPR symbols and the single traditional smiley. Symbian ≥ Belle Implements circled digits one to ten, IPR symbols, the single traditional smiley. Windows Phone ≥ 7.5 Good coverage, except for some blocks like “miscellaneous symbols and arrows”. With Bada, BlackberryOS, Meego, Symbian and WebOS being either wound down, neglected or undergoing an uncertain overhaul, support for ISO pictographs is likely to remain the preserve of Windows Phone, iOS and Android in the foreseeable future. Only Nokia S40 might be in a position to adopt this feature in the short term. Each mobile network operator (Willcom, Softbank, NTT DoCoMo, KDDI) defines its own set of emojis. While dictionaries overlap, there is no bijective relation between them. Just like with ISO pictographs, Japanese emojis correspond to symbols in the code space of the document character set. However, because of legacy character encodings, character references vary depending on whether Web pages are formatted in a UNICODE-compliant encoding (such as UTF-8) or not. For instance, the new symbol in i-Mode is represented by decimal character reference &#63874; in pages encoded with Shift_JIS (corresponding to code point 0xF982 in the Shift_JIS space), but by the hexadecimal reference &#xE6DD; in pages encoded with UTF-8. In some environments, a pictogram may be directly entered as a sequence of bytes corresponding to its character encoding. The set of emojis and their encoding may differ amongst user agents in the same device (for instance the electronic mail client and the browser). This article at technotes.areppim.com clarifies the underlying concepts and the intricacies of character encoding. Operators have published (mainly in Japanese) detailed documentation about their versions of emojis; they can be obtained from the WWW sites listed above. Comprehensive correspondence tables describing how to insert emojis into Web pages are presented at trialgoods.com. In 2012, Japanese operators harmonized the design of their pictograms in the style of i-Mode emojis. Emojis are so popular that Apple was compelled to implement a version derived from the Softbank dictionary upon launching the iPhone in the Japanese market. Version 5.0 of iOS also made these pictograms generally available to non-Japanese iPhone models after a reorganisation to comply with the ISO norm – which implies that pre- and post-iOS 5.0 devices refer to emojis through separate numeric ranges. The site iemoji.com lists each iOS emoji with its numeric encodings. The entire set of potentially relevant symbols defined by ISO inside various UNICODE character blocks amounts to well over 1300 items, and would at any rate result in an unwieldy table. Feature phones, most of them running a WAP or Openwave browser, currently represent about 75% of the installed base of handsets worldwide. The core dictionary covers the most commonly useful symbols, and, to our knowledge, is the only one to have been fully ported to WAP terminals. Hence, these tables should prove especially useful when setting up universally accessible mobile Web sites – despite the fact that several pictograms (especially “beginner”, “clear” and “toll-free”) betray their Japanese origins. Developers exclusively targeting modern smartphones need only refer to the ISO norm when inserting pictograms in their applications. iOS implements these pictograms through UNICODE combining character sequences (numeral followed by an enclosing keycap) – a feature rarely present elsewhere. Relying upon “circled digits” instead is more portable. These symbols are more generic than ISO labelled arrows at code points U+1F51D (“top”), U+1F51C (“soon”), U+1F519 (“back”). ISO character U+1F22F embodies exactly the meaning of “reserved” (e.g. seat reservation), but is a Japanese ideogram. The proposed replacement is more suitable for other countries. Already available in Android version 1.6. Only available in iOS since version 6.0. Consistent implementation only in Windows Phone 8.0. Class “emotions” is the sole subset of the optional WAP dictionary that has enjoyed some (modest) level of support in mobile phones. It comprises a number of smileys for which we propose equivalent iOS, ISO and Openwave representations. This table also applies the tweaks and descriptive conventions used for the core dictionary. Smileys have long been extremely popular in messaging applications and Internet discussion forums. Every major platform (Yahoo! Messenger, Microsoft Messenger, America Online, among others) offers a rich set of icons to let users liven up the texts they send to each other. Emoticons are entered as pre-defined identifiers or character sequences (for instance :-) or 8-|). The messaging clients of some mobile operating systems (notably Windows Phone) follow a similar approach. Unfortunately, major device description repositories provide very few data describing pictographic terminal capabilities. Developers may resort to attributes such as the type of browser or the version of the operating system run by the handset in order to fine-tune the representation of mobile pages. Detect Right supportedpictogramset array of literals List of WAP pictogram classes implemented (from UAProf). WURFL emoji true / false Indicates support for i-Mode emojis. opwv_xhtml_extensions_support true / false Indicate support for Openwave icons and other proprietary extensions. Programs that map pictogram dictionaries and encodings to each other are necessary when generating content for terminals implementing different pictographic formats, or when exchanging messages amongst them. Here is a sample of public-domain tools that translate between popular Japanese conventions. Only UNICODE encoding. DoCoMo codes erroneously assumed identical to those of KDDI. Only UNICODE encoding. Although not explicitly supported, iOS pre-5.0 uses Softbank codes. Shift_JIS and UTF-8 encodings. Although not explicitly supported, iOS pre-5.0 uses Softbank codes. We are not aware of any similar gateway utilities for ISO, Openwave and WAP. The interest in pictograms was rekindled when Apple released an iPhone model with an abundant collection of colourful icons embeddable in applications and Web pages. The revision of UNICODE published in October 2010 increases the relevance of pictograms for smartphones, but feature phones and legacy handsets have long been endowed with a comparable capability – albeit via different mechanisms. The information presented in this article should enable developers to decide how to integrate pictograms in their Web sites – taking into account requirements about application look-and-feel, the range of targeted devices, and the facilities to configure their Web service platform with pictogram generators. We recommend a utilization of pictograms more parsimonious than what one can often observe in Asian mobile Web sites. Hence, the core dictionary should suffice for the first couple of – very common – scenarios listed in section 2. Beyond this basic set, ISO specifies a profusion of idiosyncratic signs for the Chinese horoscope, Japanese places and holidays, Nippon cuisine, service ideograms, manga characters, as well as more universally interesting pictographs related to office supplies, commercial and professional activities, sports, games, vehicles, plants, animals, the weather, geometric shapes and additional emoticons. WAP defines many optional items that map easily to those ISO code points, but lacking support in WAP handsets makes this compatibility immaterial in practice. On the other hand, about 160 actual Openwave icons correspond to symbols scattered throughout UNICODE and may prove occasionally useful when catering for low-end devices. Developers can peruse the Openwave documentation to ascertain the equivalence of individual pictograms on a case-by-case basis. Sites such as shapecatcher.com and fileformat.info have query tools that facilitate the exploration of the UNICODE character space. Of course, the situation may arise where the symbol of interest is completely unsupported by a handset or a standard. The manipulation of custom icons (such as those used in the present article, extracted from the fatcow collection of free icons) is an issue to be addressed in another installment. © 2012 Eduardo Casais, areppim AG, Bern, Switzerland.